Studio to Stage @ the Queens Hall (Friday 8th March). We will be supporting two collaborative performances. The first is between Pilrig and Drummond High featuring young people with disabilities. These young people show that people with disabilities should be included in events, they have shown all the purpose and skill of other groups but have had significant barriers to over come. The two groups coming together will be performing as part of Studio to Stage for the first time. This project would not have been possible without the willingness of staff in both schools to make this happen. The second performance will involve young people from Ferryhill Primary and Broughton High School. Over the past few years pupils at Ferryhill have worked with us to create performances, this year is a slightly different take with the performance centering around the theme of segregation, with a powerful and meaningful 10 minute performance. Huge credit to the young people from Ferryhill who have talked through the subject matter and the young people from Broughton who have written the script. A special shout out to Arwen who's class talk at Broughton who started this process. Again without the support of the school staff this would not have been possible. Over the past 5 years A.R.Ts Afternoon have steadily built effective working relationships with schools in the North Edinburgh Area. Without the openess of Headteachers, willingness of schools teachers and staff, the enthusiasm of the young people and our own staff teams skill these vibrant drumming clubs wouldn't be happening. The demand is constant and we are still working to do more. Special shout out to our funders: Creative Scotland's YMI programme, Inverleith Neighbourhood Grant & Choose Youth (both City of Edinburgh Council) and Scottish Government/SCVO Community Job Scotland. Big thanks to the schools in no particular order: Pilrig Park, Broughton High School, Drummond High School, Leith Academy, Ferryhill Primary, Craigentinny Primary, Victoria Primary, Leith Walk Primary, Hermitage Park Primary and St Ninians Primary. We have some special partnership building too: Josh Barton @ UPMO, Sammy and Ash @ Destiny Church, Tanya and Olya @ World Fair Trade Tartan and Amy, Ruth @ Underbelly, Emma @ Edinburgh Carnival, Giles@ Brouhaha International and all the staff @ Fetlor Youth Clubs. We have a dedicated staff team and board who enable exciting opportunities for young people to perform and play music together. There have been some notable highlights over the last 5 years. Finally the most important part of the project.. the young people themselves. Our young people have a wide range of backgrounds but it is the way they come together that is so spectacular. Thank you for your enthusiasm and your hard work. We are working with approximately 100 young people per week. We have been working on creating pdf forms... Basically these are forms that you should be able to type directly into (via Adobe Acrobat which is free) and then email in to us. We are steadily working towards a paperless administrative system. These forms should make life easier for parents too. Simply fill them in and e-mail them to us. 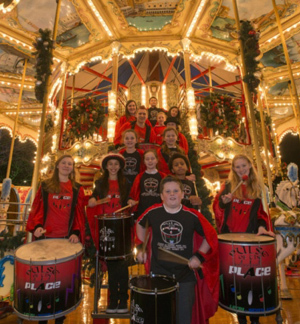 Pulse of the Place and the Drum Club Project will be performing at Light Night 2017, Sunday 19th November on the Green Stage in George Street in the centre of Edinburgh. 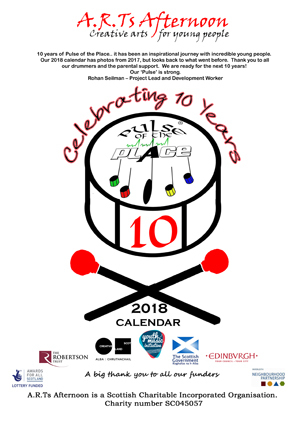 We have two performance slots, mainly due to having too many youth drummers.. there will be 72 drummers performing as part of Pulse on the 19th. Pulse of the Place have hardly had time to draw breath this month.. Pulse got to lead the Fair Trade Parade from the City Chambers to Princes Street Gardens and then open the Fair Trade concert at the Ross Bandstand... and if that wasn't enough Pulse were then invited on stage to jam with the Red Hot Chilli Pipers. Video to follow soon. 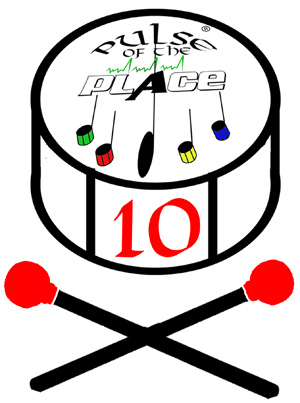 Then there was the Pulse of the Place 10th Anniversary Tour to Brighton, London and Manchester. Too many highlights to mention. Rohan went down ahead of the band and ran a couple of workshops at Downs Junior School in Brighton with their amazing head of music, Anna Rutsbatch. 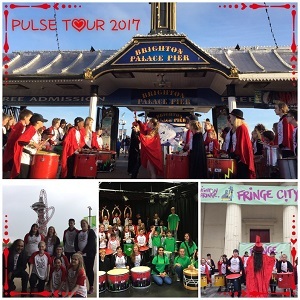 When Pulse arrived in Brighton they performed at Downs Junior School, before heading up to Varndean High School to meet their samba band and goats. Robbie Mitchell (Varndean music tutor and Pulse's first mentor) even came in on his day off. Both bands performed to each other before formng an awesome combined band. Both visits were tinged with something a bit different with a tour around the underground bomb shelters at Downs Junior and meeting the goats... yes...the goats at Varndean. The following day there was a chance for a bit of sightseeing around Brighton before our final performances in Brighton at The Beach, The Brighton Fringe Festival and the Palace Pier. Our final day of the tour was a visit and jam with the excellent youth band Jubacana in Manchester... We are already looking forwArd to the next one..
We have just secured a third year of funding from Creative Scotland's Youth Music Initiative. A big thank you to Stewart Crabb (Ferryhill Primary), Sarah Kinnaird (Craigentinny Primary), Laura Thomson (Victoria Primary), Catriona Ferguson (Pilrig Park School) and Jack Simpson (Leith Academy) for their amazing support. However most important are the young people that turn up every week and make the groups what they are. This means the Drum Club Project is funded at least until March 2018. We have also got another grant from the Inverleith Neighbourhood Partnership.. Thank you Elaine Lennon. We would just like to thank the Robertson Trust for the 3 year funding award and the Inverleith Neighbourhood Partnership. As the most bitter Presidential campaign in the United States draws to its conclusion, Caitlin Munn travelled to the US to be part of the last week of the election with 3 fellow pupils from Leith Academy. 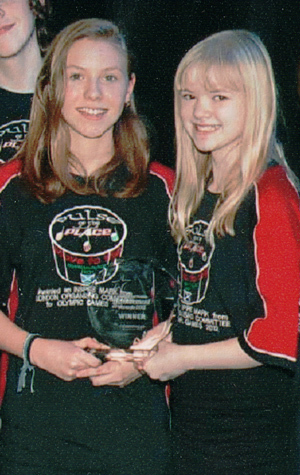 Caitlin has been in clubs for a long time (since p5) and we have some pictures of a very young Caitlin. She is a thoughtful and intelligent young woman. Although we know she will learn from the experience..we also think people will learn from her..
Pulse of the Place will return this coming weekend to play at the Liverpool Brazilica Carnival. We are looking forward to a spectacular night-time carnival. This is our 3rd visit to play in the Night time carnival in Liverpool, our last time was in 2011... but we are doing more... Edinburgh Carnival kicks off from The Mound and heads along Princes St at 2pm the next day and we will be there too. We were alerted to the fact that our website had disappeared, this was down to our old host deleting web space and not offering web hosting anymore. We have a new host and the site is back up. Apologies for any inconvenience this caused. We have received another year of Youth Music Initiative Funding from Creative Scotland/ Scottish Government. This enables us to continue to run the very successful drum clubs in the North Edinburgh Area. Thank you to the schools and community venues that support this venture. 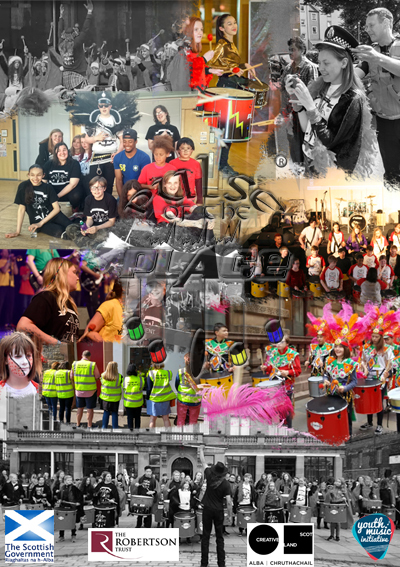 More news about drumming and funding to come in the new newsletter. Although our website has been down, we have been incredibly busy, with performances at the Newhaven Gala, Drylaw Festival, Hermitage Park Fayre, Craigentinny Primary Music Night, Deans Gala, Glasgow Massed Band and Glasgow Youth Showcase. 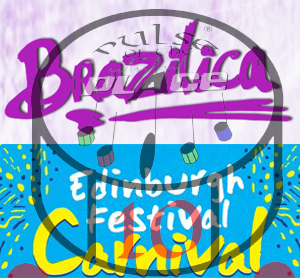 In the next month we are performing at the Scottish Parliament, Winchburgh Gala and then down to Liverpool for Brazilica. Brazilica Festival in Liverpool will be the start of a year of celebration to mark our 10 Year Anniversary and it will include performances in Brighton and London.... Exciting times... The beat is building... posted on 28th June 2016 . This issues contains a centre pages collage of photos from last year, if you are in Pulse of the Place or the 'Drum Clubs' check it out and see if you can spot yourself!! We have had a great year and would like to wish you all a Merry Christmas and a Happy New Year. Sunday 22nd November, it's Edinburgh Light Night. The 'Drum Clubs' and Pulse of the Place will be performing together forming a youth band of nearly 70 young people. The young people come from a wider geograpical area than before and the Drum Clubs main representation is from Ferryhill Primary School, Craigentinny Primary and Victoria Primary School. Light Night provides a fantastic opportunity for young people to be involved in a big city event and without the funding from Creative Scotland this opportunity would not have been possible. The Drum Clubs have put a thunderous performance together. Pulse of the Place will also have another performance later on in the afternoon, giving them a chance to showcase their skills... the first opportunity for many of our new members. 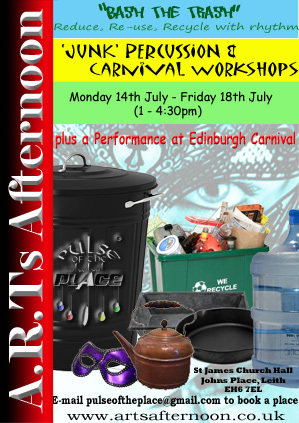 Sunday 19th July at The Mound and into Princes Street... it's the Edinburgh Carnival.. This is a spectacular event and Pulse Of The Place will be there. For some of our new drum clubs members this will be there first performance. So if you see us give us a big cheer!! We were asked by the Edinburgh Carnival to take part in their official photoshoot to launch the publicity for this years Carnival. So after a quick trip round a number of schools and donning some costumes... we were ready. The nuts and bolts really aren't that glamorous but we made onto STV News that night. Pulse of the Place took their place alongside three other youth street bands to perform at the Glasgow West End Festival. The piece that was performed was written by Sarah and Holly, they also had the joy of having an hour to pull it together before the performance. The performance marked the end of this leg of Hoots which has looked to support the 4 youth street bands. Olivia Furness referred to this performance as being the debut of the Scottish National Street Band. Fantastic event with a brilliant performance by the combined youth bands. We have decided it is time to re-vamp our Friday afternoon clubs... so from Friday 24th October we will be running "Find Your Voice" from 1:15 - 2:45pm and "Find The Beat" from 2:45 - 4:15pm. Both clubs will be for children aged 5 to 12 years and will primarily focus on building confidence and having fun! 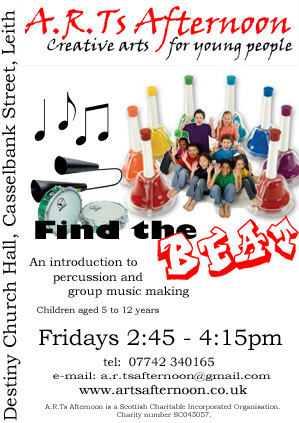 "Find the Beat" will build from our Beat The Bin project using body percussion, tap and clapping to create rhythms.. as well as some interesting sounds using handbells. Check out our Facebook page www.facebook.com/artsafternoon either for information or as a means of contacting us. We are pleased to announce that our application to OSCR for charitable status was successful and A.R.Ts Afternoon is now a registered charity. A big thank you to those who worked on the application. Pulse of the Place took their place alongside some amazing street performers at the Festival busking sites. 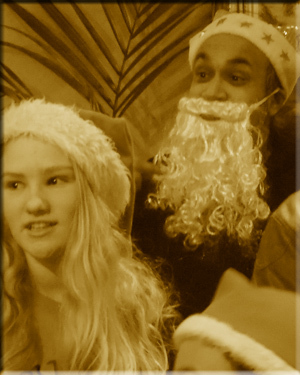 There were 3 performances at the allotted venues: one at the Art Galleries and two in Parliament Square. There was a fantastic atmosphere and the Festival staff could not have been more helpful. In September we headed off to Edinburgh Airport to try our first drum flash mob. It was a fun way to spend a few hours and we came away with lots of ideas of how we could do more... so watch this space! Special thanks to Sandra Tomney for her help in organising this gig... always helps to have people with the right contacts. 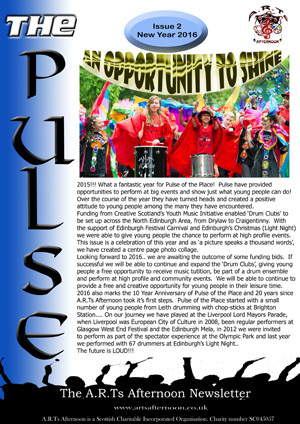 In July, Pulse of the Place took part in this years Edinburgh Carnival. The feedback from the organisors was extremely positive. We also had a parents band supporting the fantastic rhythms of 'Pulse'. The carnival itself was spectacular and it was yet another amazing opportunity for young people to take part (and be valued) in a huge event. The crowd was estimated to be around 40,000 people who lined The Mound and Princes Street. The day was full of special moments, however there was a point when Pulse of the Place were involved with a call and response impromptu jam with Samba Ya Bamba (an amazing band)from Glasgow. These moments would not have been possible without our two projects, 'Beat the Bin' (funded by Leith Decides) and 'Bash The Trash' (funded by Starbucks and Youth Scotland). Thanks to our funders for helping us provide this amazing opportunities to young people. Pulse of the Place were very busy in June, playing at galas in East Whitburn and Shotts. Both communities enter into their gala days with real gusto to make them brilliant and friendly events. 'Pulse' also played at Trinity Primary School Fair which seemed to use every inch of the school to contribute to what was a fantastic event. 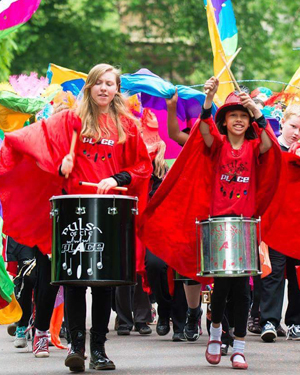 Pulse then travelled to Glasgow to take part in the West End Festival Parade complete with a Samba Jam with The Edinburgh Samba School and Samba Ya Bamba. Special thanks to Michael Dale... who asked to come back again next year.. but also to bring more drummers... The Commonwealth Torch through Dalkeith was up next, new friends were made with young people at Mayfield Primary and the mass drumming band was organised by Jenny Gardener an event with a great community feel.. a few memories came flooding back about the Olympic Torch Parade in 2012. Leith Decides is on Saturday 15th February from 1pm - 3pm at Leith Community Centre. 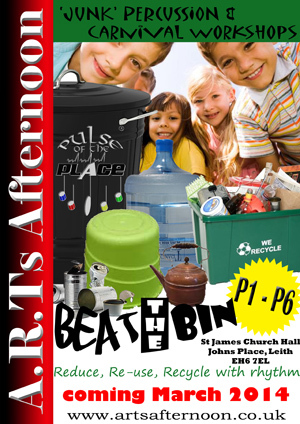 A.R.Ts Afternoon has a funding bid to enable us to run junk percussion and carnival costume sessions for p1 - p6. PLEASE GIVE US YOUR SUPPORT AND MARK '5' FOR A.R.Ts AFTERNOON (WHICH IS NUMBER 3 ON THE LIST). We will post whether we are successful on this news page.